Training is an essential need of corporations today who are looking forward to build stronger resource pools. It is defined as an activity that leads to competent behavior. It is one need that other than providing security to its workers also makes them feel more associated o the organization and thus helps up bring a workforce that is satisfied and happy and willing to change according to the demands of time. This helps them grow together and marking them as strong corporate families. How important are trainings and other such development tools for an organization is a question that requires much attention. A trained, skilled employee renders satisfactory and competitive returns. Such an employee remains highly motivated and loyal to the firms. Training is considered a major investment among businesses. It decreases employee turnover rate and develops stability within a management system. However the organizations of today tend to spend a lot without realizing successful results. Fact being that instead relying on explicit information required for meaningful processing by business entities they get confused with overloaded data. Hence when it is time to make strategies and decisions the management is at a loss from where to take a start. This completely overrules identifying the training needs on personal and organizational level. However with softwares like Balanced Scorecard and its real-time data flow management and control of staff working at varying hierarchical management levels can be made possible. It entails a database system responsible to collect or retrieve information required for planning and supervision at various levels. Without the help of such tools measuring training needs with precision can prove to be unfruitful. 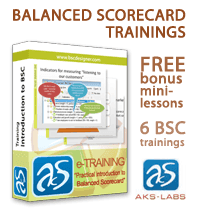 The scorecards with its pre-defined ‘metrics’ or ‘indicators’ like; Learning Development, Behavior proceeds, Business growth and Fulfillment of social contract etc. each assigned with a numerical value, can be reviewed or edited at any given time and curbs subjectivity from the developments. This helps ascertain the training needs and objectives and the combine results required to formulate the training methodology and implementation stage. It also comes with built in strategy maps that allows to foster relationship of the need metrics and the performance indicators. Thus, the results obtained are transparent and targeted that match the needs of organization and its various departments.It also offers stop lights as one of the visual effects that can be very handy at the time of any presentation. With its three colored warning spectrum of red, yellow and green to signify and focus on areas that need attention. However, they are editable and can be turned off according to the circumstances.Balanced Scorecards not only clarify the organizational requirements and its tasks but also define the expected and accepted level of accomplishment by each individual. This helps in strong understanding of job requirements and its demands to the employees.